OSPF (Open Shortest Path First) is a link state routing protocol. Because it is an open standard, it is implemented by a variety of network vendors. OSPF will run on most routers that doesn’t necessarily have to be Cisco routers (unlike EIGRP which can be run only on Cisco routers). uses only one parameter as the metric – the interface cost. the administrative distance of OSPF routes is, by default, 110.
uses multicast addresses 224.0.0.5 and 224.0.0.6 for routing updates. Routers running OSPF have to establish neighbor relationships before exchanging routes. Because OSPF is a link state routing protocol, neighbors don’t exchange routing tables. Instead, they exchange information about network topology. Each OSFP router then runs SFP algorithm to calculate the best routes and adds those to the routing table. Because each router knows the entire topology of a network, the chance for a routing loop to occur is minimal. OSPF routers need to establish a neighbor relationship before exchanging routing updates. OSPF neighbors are dynamically discovered by sending Hello packets out each OSPF-enabled interface on a router. Hello packets are sent to the multicast IP address of 224.0.0.5. Routers R1 and R2 are directly connected. After OSFP is enabled both routers send Hellos to each other to establish a neighbor relationship. You can verify that the neighbor relationship has indeed been established by typing the show ip ospf neighbors command. 1. using the router-id command under the OSPF process. 2. using the highest IP address of the router’s loopback interfaces. 3. using the highest IP address of the router’s physical interfaces. By default, OSPF sends hello packets every 10 second on an Ethernet network (Hello interval). A dead timer is four times the value of the hello interval, so if a routers on an Ethernet network doesn’t receive at least one Hello packet from an OSFP neighbor for 40 seconds, the routers declares that neighbor to be down. Before establishing a neighbor relationship, OSPF routers need to go through several state changes. These states are explained below. 3. Exstart state – beginning of the LSDB exchange between both routers. Routers are starting to exchange link state information. 4. Exchange state – DBD (Database Descriptor) packets are exchanged. DBDs contain LSAs headers. Routers will use this information to see what LSAs need to be exchanged. 6. Full state – both routers have the synchronized database and are fully adjacent with each other. OSPF uses the concept of areas. An area is a logical grouping of contiguous networks and routers. All routers in the same area have the same topology table, but they don’t know about routers in the other areas. The main benefits of creating areas is that the size of the topology and the routing table on a router is reduced, less time is required to run the SFP algorithm and routing updates are also reduced. 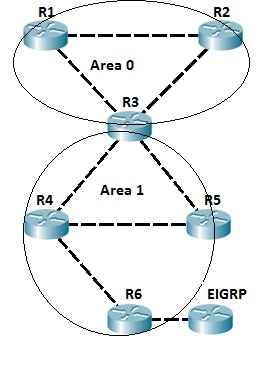 Each area in the OSPF network has to connect to the backbone area (area 0). All router inside an area must have the same area ID to become OSPF neighbors. A router that has interfaces in more than one area (area 0 and area 1, for example) is called Area Border Router (ABR). A router that connects an OSPF network to other routing domains (EIGRP network, for example) is called Autonomous System Border Router (ASBR). In OSPF, manual route summarization is possible only on ABRs and ASBRs. To better understand the concept of areas, consider the following example. All routers are running OSPF. Routers R1 and R2 are inside the backbone area (area 0). Router R3 is an ABR, because it has interfaces in two areas, namely area 0 and area 1. Router R4 and R5 are inside area 1. Router R6 is an ASBR, because it connects OSFP network to another routing domain (an EIGRP domain in this case). If the R1’s directly connected subnet fails, router R1 sends the routing update only to R2 and R3, because all routing updates all localized inside the area. The role of an ABR is to advertise address summaries to neighboring areas. The role of an ASBR is to connect an OSPF routing domain to another external network (e.g. Internet, EIGRP network…). The LSAs (Link-State Advertisements) are used by OSPF routers to exchange topology information. Each LSA contains routing and toplogy information to describe a part of an OSPF network. When two neighbors decide to exchange routes, they send each other a list of all LSAa in their respective topology database. Each router then checks its topology database and sends a Link State Request (LSR) message requesting all LSAs not found in its topology table. Other router responds with the Link State Update (LSU) that contains all LSAs requested by the other neighbor. After configuring OSPF on both routers, routers exchange LSAs to describe their respective topology database. Router R1 sends an LSA header for its directly connected network 10.0.1.0/24. Router R2 check its topology database and determines that it doesn’t have information about that network. Router R2 then sends Link State Request message requesting further information about that network. Router R1 responds with Link State Update which contains information about subnet 10.0.1.0/24 (next hop address, cost…).